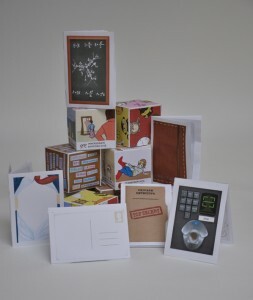 To support the Pallion Ideas Exchange, we have created numerous printed materials including posters, worksheets, postcards, work flow diagrams and eBooks. These have been designed to help record concerns, hopes and aspirations, which could then lead to further discussions and point to the right person who may have had the same experience. The design ideas behind these printed materials relied on the feedback and conversations the team had gathered with the members of the community in Pallion. 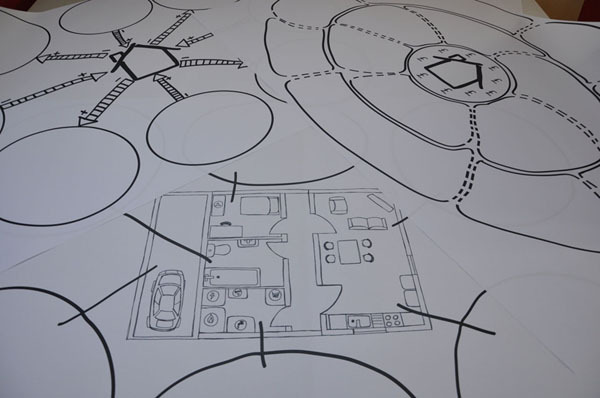 It became a highly iterative process of adapting earlier work though co-design and initiating and making new pieces such as the workflow sheets as a response to ideas and suggestions that had been gathered in our workshops. The main consideration when designing, was the importance to keeping it visually simple and informal. 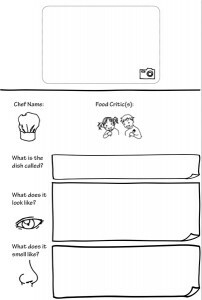 One example being in the eBooks, we didn’t want to create pages that may put people off by making it look too similar to application forms, but we wanted the eBooks to have a familiar structure for people to fill in with ease. To overcome this, I simply drew the boxes by hand; adding a folded corner and colour coded the outline to indicate the page sets. 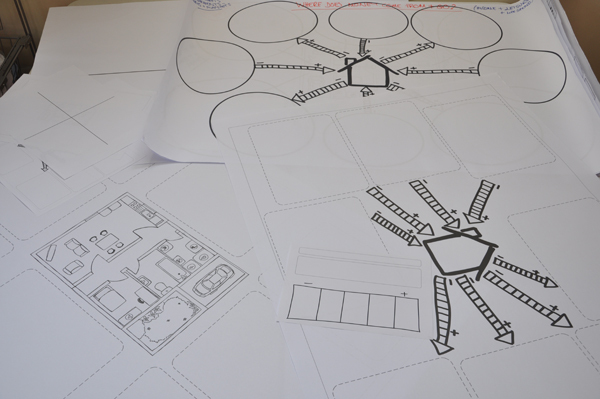 We agreed that the hand drawn method seemed more approachable and was implemented on all the other printed materials. 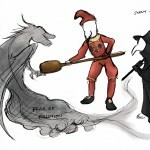 The illustrated scenarios had to be within an informal environment and drawn simply, but most importantly; approachable. 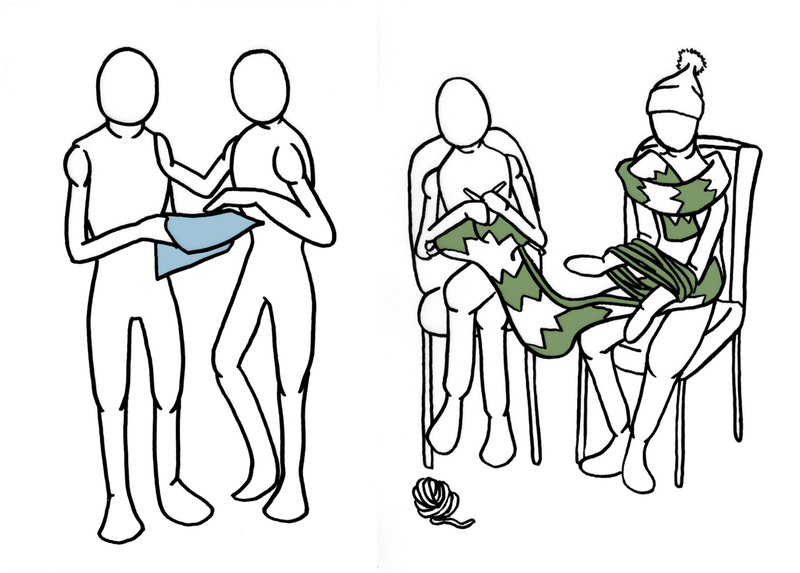 So instead of my usual mannequins which you may have seen in previous projects, these illustrations of people had a very simple outline. The props and environment were kept minimal, with only flat colours highlighting the activity. With this a library of illustrations were created for the team to use. 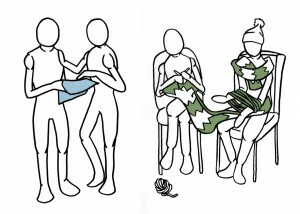 Examples of some of the illustrations; the one of the left is someone giving advice to another, and on the right is of an activity. 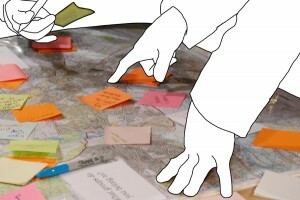 The most challenging part of the project when illustrating was creating the three “Aspirations” images that are used in the “Visualising the network” map to reflect what the community hope to achieve in terms of “social cohesion”, “a better local environment” and “better life opportunities”. Each had to reflect various aspects in a single image, most of which were easy to explain in words but to frame it in one image required a lot of conversations amongst the team and just thinking about situations which we ourselves may have experienced or seen. The process for this particular part of the project was to think of how each aspect would be illustrated individually and gradually piece them together and tweaking it to make it work as one whole image. Although at first we weren’t sure how the “Visualising the network” map should look like we used these three aspiration images as a starting point and the rest was straightforward. Having created a library of illustrations for activities and resources for PIE that we’ve used across the project, I re-used many of the images so that they will become easily recognisable. 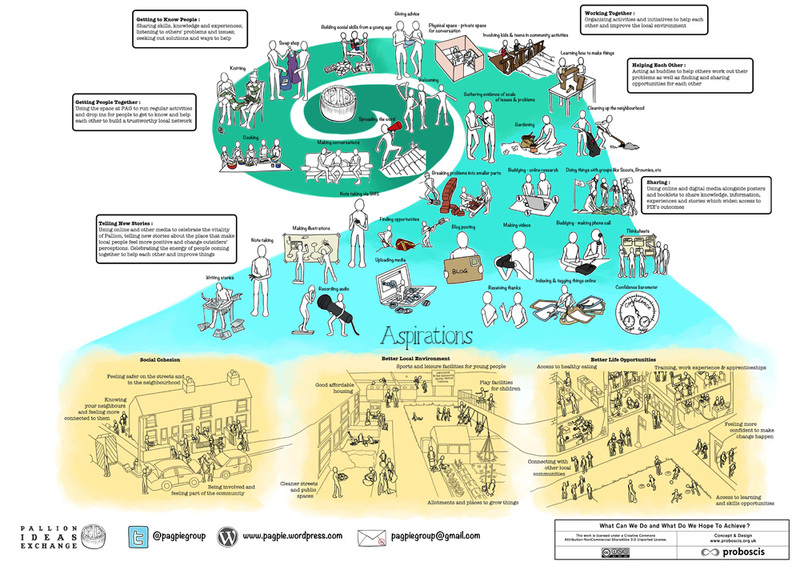 These image files will become part of Proboscis’ forthcoming Neighbourhood Ideas Exchange Toolkit along with generic versions of the posters, worksheets, work flow diagrams, eBooks and postcards we have developed for the Pallion Ideas Exchange project. 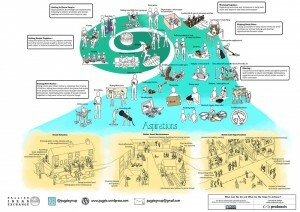 With this toolkit we hope to inspire others to adopt and adapt the parts for their own local social innovations. 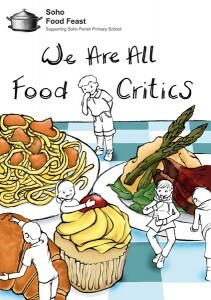 The Soho Food Feast is just around the corner and I am so excited that the bookleteer notebook specially designed for this event will be used by the children of Soho Parish Primary School as they become food critics for the day. I had a lot of fun illustrating the front cover for this notebook, though browsing through various mouth-watering photographs of dishes to illustrate before lunch wasn’t a good idea. At first the initial sketch was rather unhealthy. 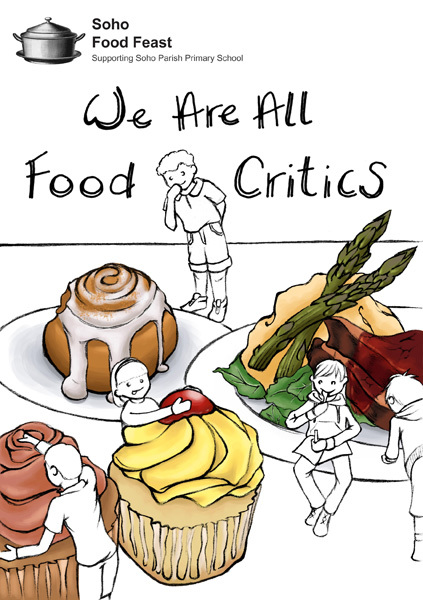 It had more pastry, which seemed appealing to illustrate at the time because of its fancy presentation.But of course healthy eating is very important; especially for children, so the cover design was altered to a healthier version. Inside the book in a very simple layout are spaces for children to scribble in and the blank pages at the back are for them to get creative and sketch their own feasts. 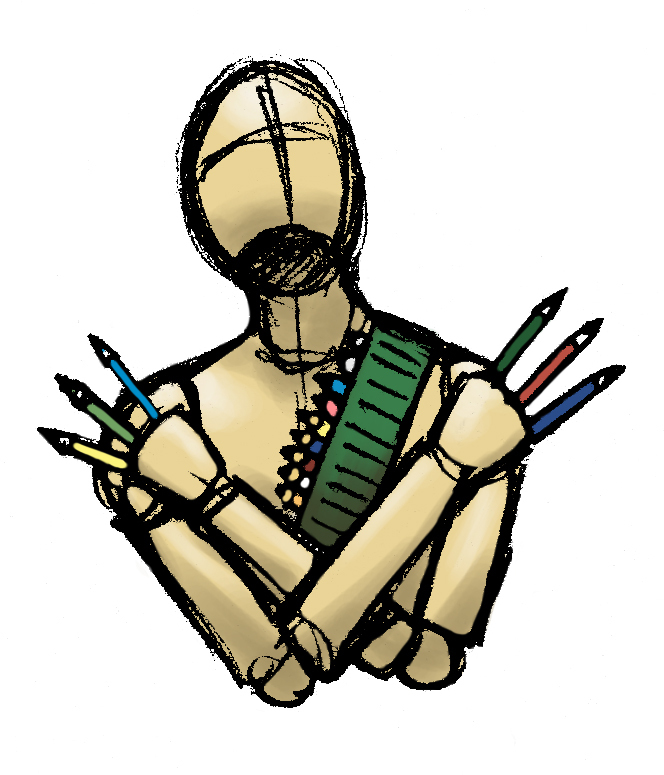 Props to be used for upcoming Bookleteer animation. A snapshot of my cluttered desk, here’s a sneak peek of what I’ve been busying away with; these are props I am creating for an upcoming cut paper animation illustrating how to use Bookleteer. 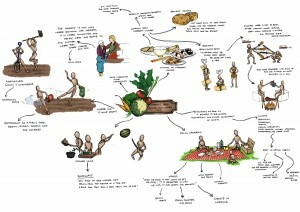 Visual mind map about folklore. Traditional beliefs, customs, stories passed down through generations, superstition; you’ve come across some of these at one point in your life or it may still be a part of you to this very day. 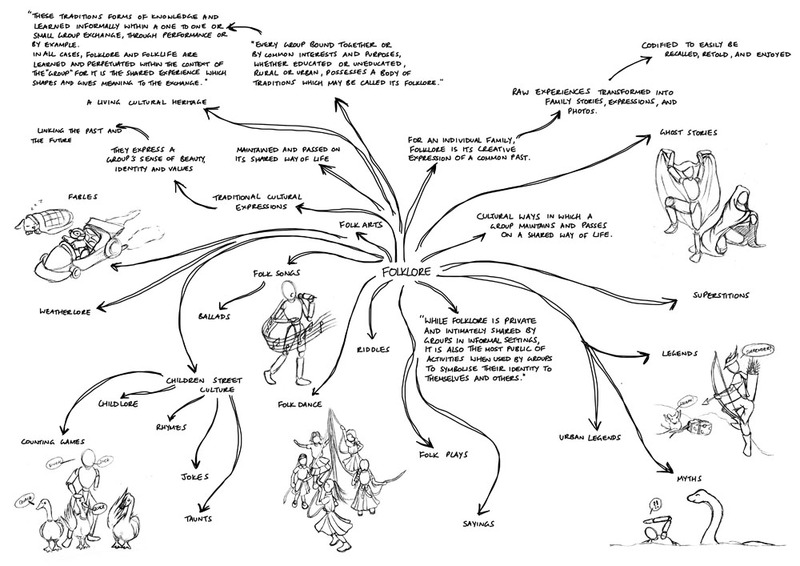 My next mind map for the Compendium is about Folklore. Here I explore the different methods to which groups maintain, share and pass on traditions. 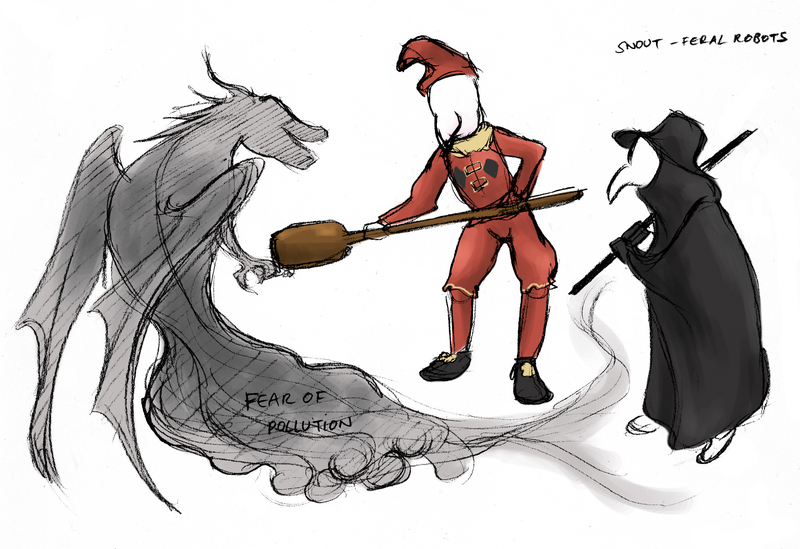 It also contains quotes from the New York Folklore Society website, where people expressed what folklore meant to them and how it affected their daily lifestyle. 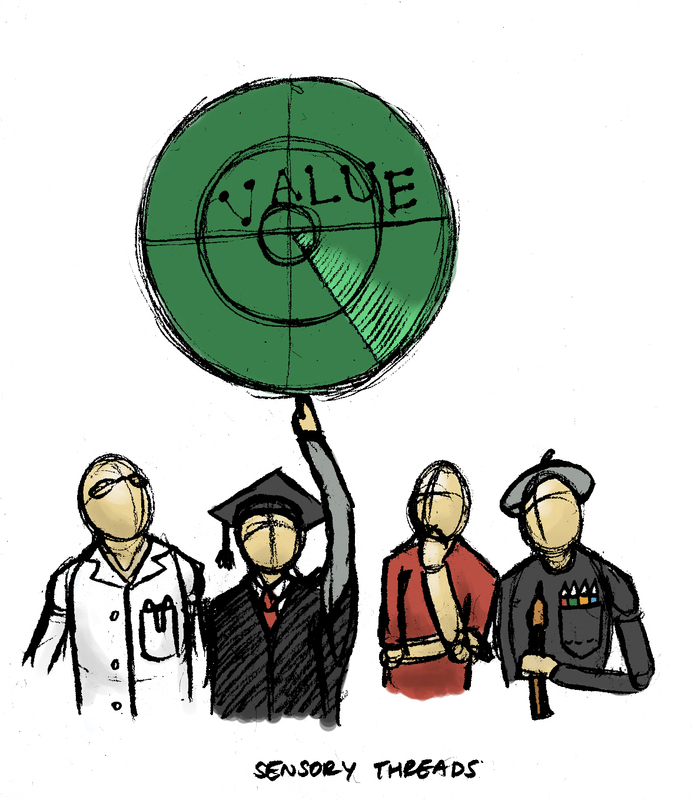 The cultural aspect is a public good, the knowledge or reasoning of why something is the way it is. 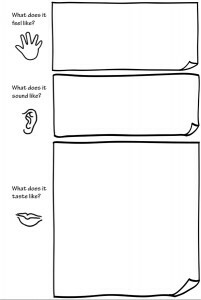 A method people use to teach others about experiences expressed as stories, songs, performance, legends, myths and rhymes. It is something communities strive to maintain as folklore symbolise their identity to themselves and others. As part of our work on the VOME project with researchers at Royal Holloway, University of London’s Information Security Group we are working with Pallion Action Group in Pallion in Sunderland on a community engagement project to co-design a process with the local community in Pallion, Sunderland to create a knowledge network around money, spend and budgets. 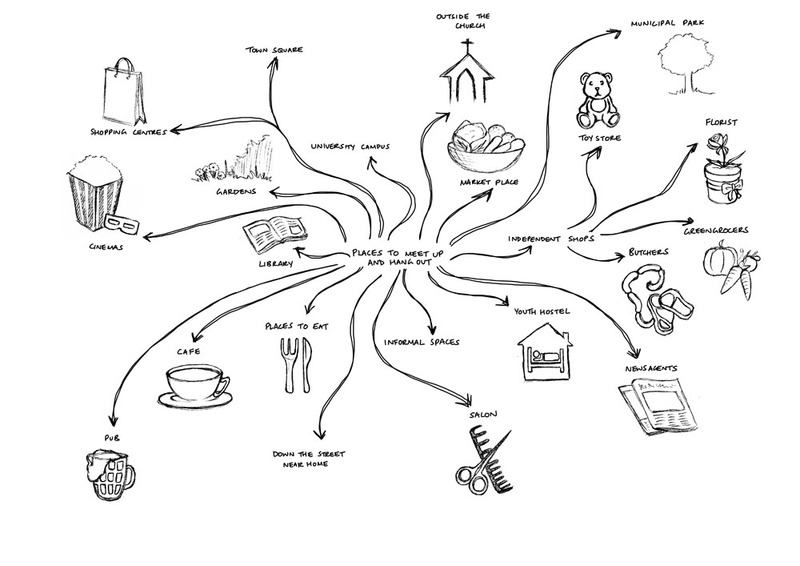 We are collaborating with PAG to identify the areas and issues challenging people around household economies. The project feeds into VOME’s aim of “exploring how people engage with concepts of information privacy and consent in online interactions”. We’ve have been co-designing designing a set of huge posters with people at PAG to help gather knowledge and find the right language to use. 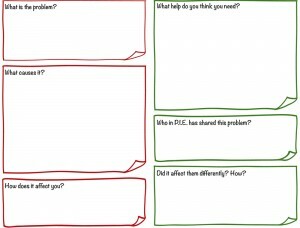 We took a first set up recently for the first exploration session, and based on peoples’ comments revised and changed them and will be heading off to do a two day series of activities with local people to dig deeper into peoples concerns about costs, spend, what we can rely on and what is unreliable. I think the project is going to involve some very interesting cycles of creating, discussing, revising, changing and re-producing materials until we can collaboratively come up with the right materials. Continuing my exploration into public goods for the Compendium I thought about public spaces; parks, the town square, spaces that doesn’t require a fee to access. In these spaces, we often see people walking around, hanging about, waiting for someone, conversing with each other, and so on; and then it hit me – places to meet and hang out can be considered as a public good. These could be conventional spaces such as the park or places that encourage socialising like a cafe, but there are also informal spaces; ones that are not dictated. An example of an informal space brings me back to my university days; every weekend when I had to go to the main high street to buy food for my deprived fridge, I would have to walk through the town square where flocks of teenagers would hang out, spreading across the flights of stairs and having to dodge the dangerous skater boys practicing stunts from one side to the other. It was the same every weekend without fail. 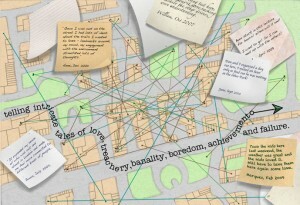 Visual mind map about places to meet up and hang out. Not quite the paper theme but still folding! This was a video clip I had seen a few years back, and it was my current research for the Compendium that reminded me of the video. A demonstration created by the Pentagon research scientists; of a tiny robot as thin as a piece of paper covered with predefined folds. 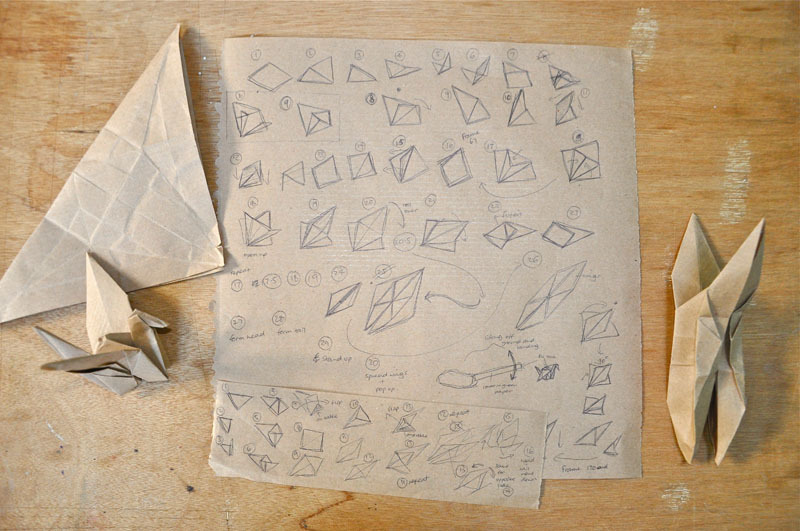 It wasn’t quite origami but using algorithms the tiny robot folds itself into the shape of a boat and then a paper plane. Quite amazing huh? I am not confident enough to go into robotics just yet, but for now I think I’ll stick to paper craft. Continuing with my experiments for the Compendium using paper crafts, I wanted to try animating with 3D models. To animate something that was flat pack and have it lifting up as if inflating and popping up into shape from the ground. 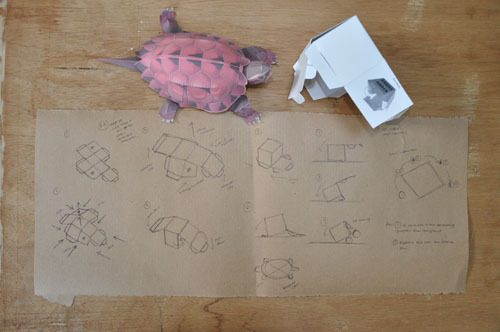 So I went on a hunt for a 3D paper model – thus coming across the tortoise designed by Konica Minolta. It took some time to assemble but the finished tortoise looked great. I named the studio's new pet, Yumi. 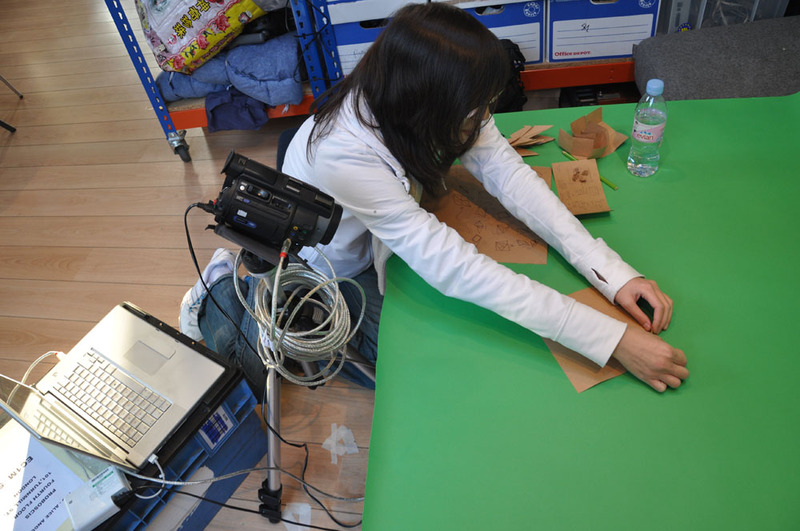 But Yumi was not a flat pack, she was made up of separate pieces, so the aim of the experiment changed slightly to experimenting puppetry with Yumi a 3D model and have a story cube inflate into shape instead. This time round the experiment had two subjects or actors if you will, in the scene. So the difficulty here was getting the timing right between the two. Screen captures of Yumi walking around the cube as it folds itself. I’ve always admired the works of a craftsman, and I definitely feel that their skill as an artisan can somehow be reflected in the Compendium. But can craftsmanship really be considered as a public good? I turn to the Heritage Crafts Association, advocacy body for traditional heritage crafts for some answers. There I find an article by Professor Ewan Clayton, who explains all that I am unable to convey in words. He talks about the importance of heritage crafts and that “craftsmanship have an interesting relationship to time” the embodied wisdom from the craftsman of a time is reflected in the artefact created, the interaction or activity that may involve the artefact, becomes a cultural resource. He also mentions the focus in safeguarding traditional craftsmanship should not be made to preserve craft objects but to create conditions to encourage artisans to continue their practice and to transmit their skills and knowledge to others. I also stumbled upon Richard Sennett’s book titled Craftsman, which mentions how medieval workshops provided a communal atmosphere and a social space, that bound people together forming a community of masters and apprentices. Both Professor Ewan Clayton and Richard Sennett made insightful points about craftsmanship in the past and in our current lifestyles, it was also a sad reminder of craftsmanship that have become so rare and at risk of being lost forever that it made me want to learn more about them. 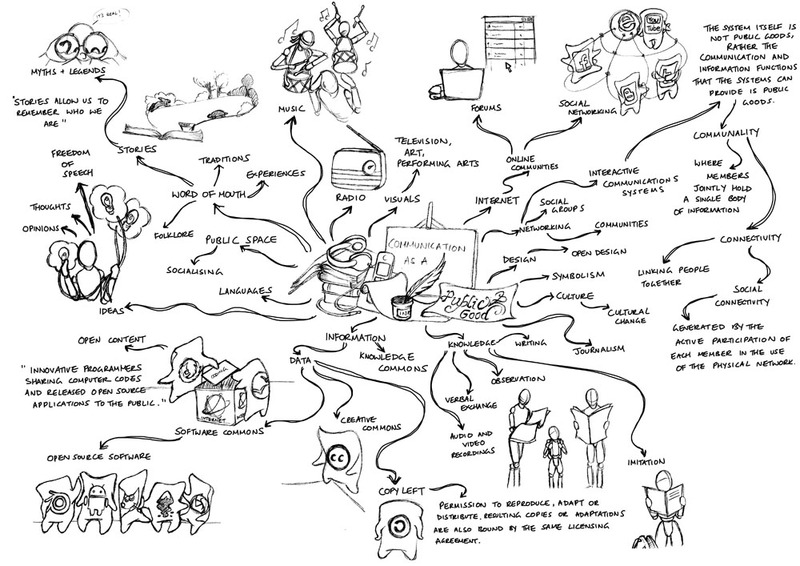 Visual mind map about craftsmanship. The folding paper piece was quite quick and simple to animate, so the next one to experiment with for the Compendium needed to be a bit more challenging. A self folding origami crane. For those who are familiar with folding the crane, you’ll know that the crane have symmetrical folds ; so the real challenge here was working out how to make the paper flip over to carry out the repeated folds once one side completed the necessary step. My first attempt in solving this issue became too complicated and confusing, that I had to stop animating and go back to the drawing board to revise the storyboard. Storyboard for self folding origami crane. Following the new storyboard the animation progressed at a good pace at the start but towards the end I wasn’t consistent with the number of key frames so it may look like the crane got impatient and hastily folded itself during the last few seconds. Despite the frames per second, I achieved the main goal of animating a self folding origami crane! 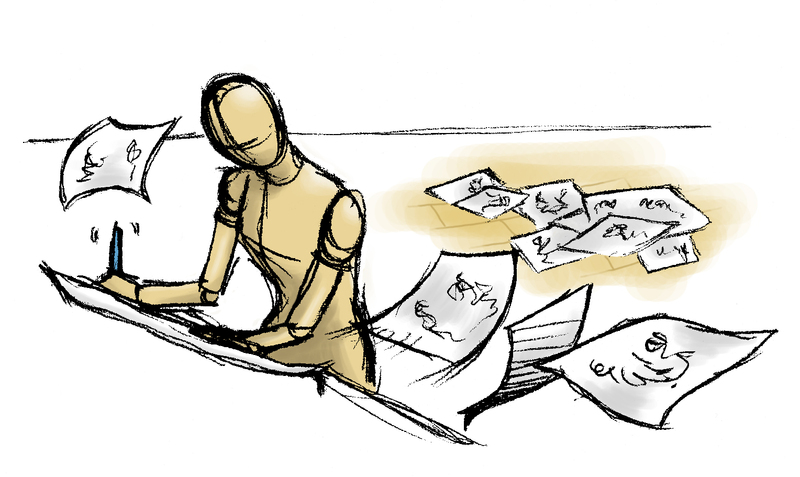 But to maintain the consistency of frames, I am going to need to devise a time sheet to go along with the storyboard. Screen captures of the self folding origami crane animation experiment. Branching out from the idea of social transactions; mentioned in a previous post about Stefan’s reunion over the holidays, led me to the topic of communication as a public good. How do we carry out these social transactions? Why is it so important to convey our thoughts and opinions to others and how will this result as a public good? Communication fits the description of being both non-rival and non-excludable; words used from an economic point of view to define what a public good is. 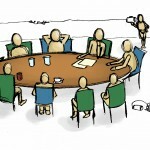 Thanks to conventional methods and modern technology, sharing ideas and thoughts have become widely available. But the point I am trying to make here is how we use these ‘props’ to communicate and share information. The internet itself is not a public good, rather the communication and information functions it provides is. As a result the internet has given opportunities to create online communities that allow social connectivity of diverse groups, sharing information and knowledge that led to the creation of open source applications. 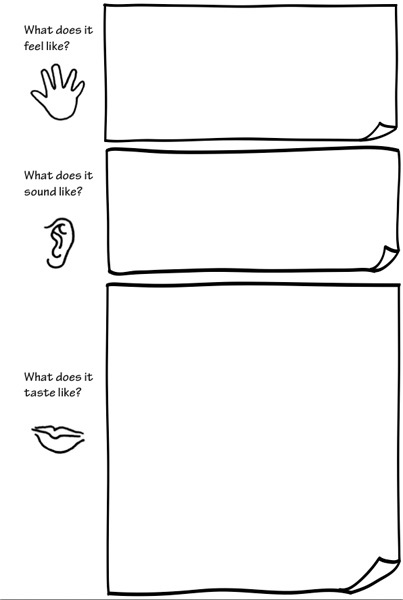 Taking these thoughts and ideas for the Compendium, I illustrated and brainstormed examples of our methods of communication through traditions; stories of experiences, songs, and visuals. Also thinking about the different outcomes created from the act of communicating such as social groups and communities linked through common interests, open source materials, data and information. 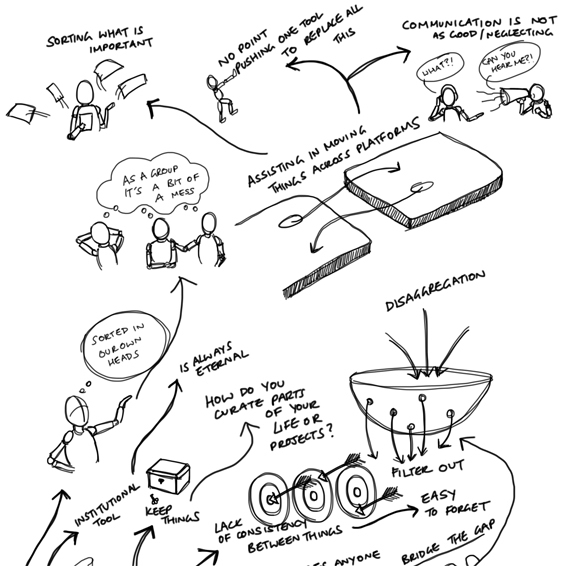 Visual mind map about communication as a public good. Whilst researching animation techniques for the Compendium of Public Goods, I came across many innovative and inspirational animations and thought it would be a good idea to share my findings through a series of posts. Without further ado, I present SNASK; a stop motion animation created by Mike Crozier, an inspiration for my first animation experiment Folding Paper. The SNASK animation consists of clever transitions between different colourful patterned papers and eventually forming a box within a box, which changes into a TV and then ending the animation with the TV sinking into the desk. The whole animation was compiled from a total of 1846 photos! SNASK from Mike Crozier on Vimeo. 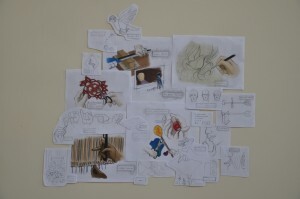 Coffee Time by Wan-Tzu is an adaptation of Mike’s work, using SNASK as a template to learn and practice stop motion techniques. The video was a recreation of effects used in SNASK but given a storyline that reflected the creators love for coffee. I really liked the smoothness of the coffee machine interface, and the use of wool to represent the coffee, very clever! Coffee Time from wan-tzu on Vimeo. Having spent some time researching about animation techniques for the Compendium, I was nudged to move away from my desk and start experimenting with animation on the other side of the studio. There, I was greeted with a green screen; a roll of thick green paper which Alice had heaved up the many flights of stairs and hung up ready to go. The camera positioned and set in place hooked up to the laptop; this marks the beginning of the animation experiments that I’ve been looking forward to. 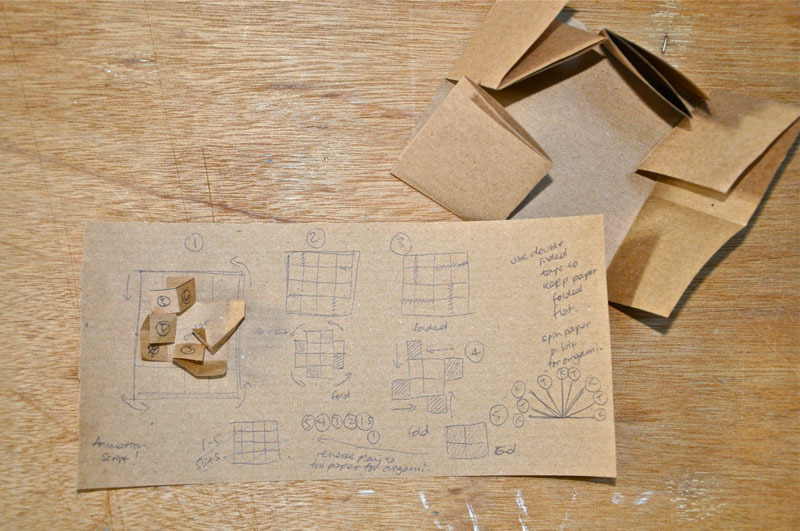 Storyboard for the simple folding paper animation. My first experiment! 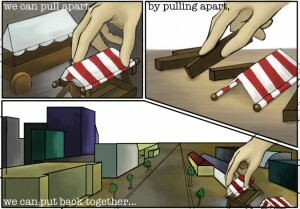 ‘Folding paper’. 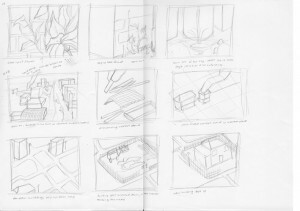 I began by making quick sketches of the key frames with the help of a prototype of the subject to work out its movements. 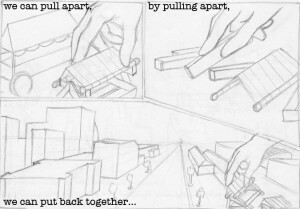 Using stop motion and following my storyboard, this paper will fold itself.This is so much fun! Screen captures of my folding paper animation experiment. 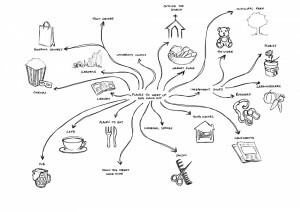 As part of my explorations into the notion of Public Goods for the Compendium, I’ve been creating some sketch maps that explore how to define public goods. What are they? Public goods come in many forms and their meaning and values vary among different groups of people. Whilst preparing to have lunch with the team, Stefan began telling us a story about his family feast during the holiday season. The social transactions he had during the reunion, the reminiscing of traditional dishes. 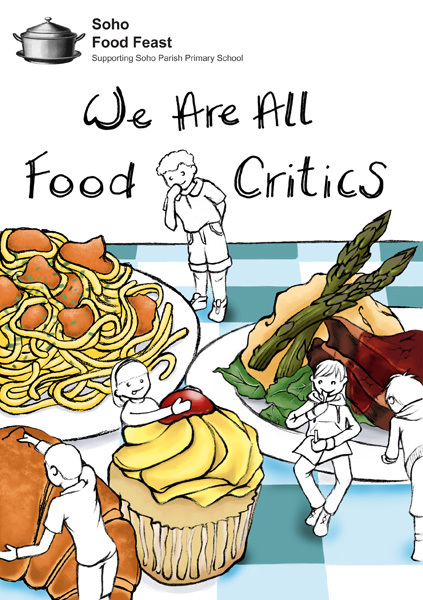 It sparked the thought that it wasn’t just the act of sharing food that was a public good, but everything that evolved around it. Where and how we get our food; the agricultural skills and knowledge needed to grow our food; the market place in which people come together not just to buy goods but for social interactions and where communities share stories; the history and culture, our traditions and sociology behind food, and ‘Foodways‘ – a term used to describe any piece of food culture which once existed in a time and place that tells a story about who we are. 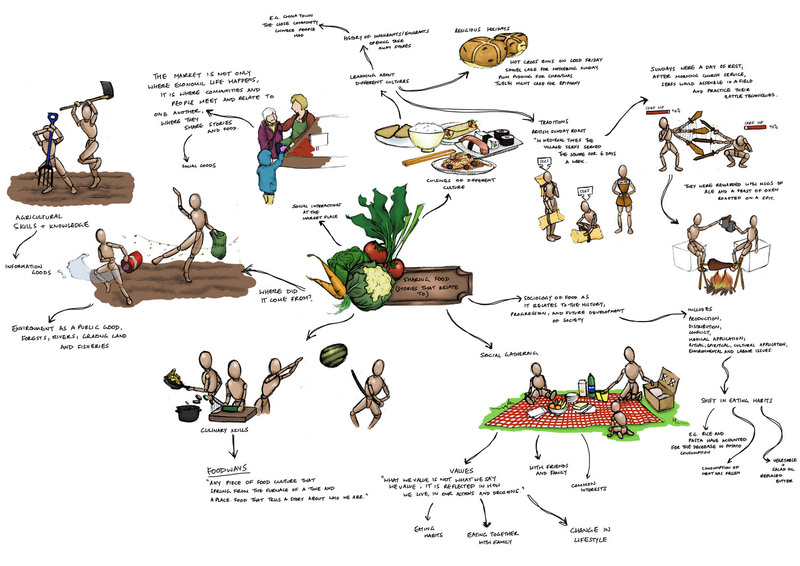 Visual mind map about sharing food. Recently the Proboscis team have been working with the Centre for Applied Research in Educational Technologies (CARET) and Crucible at the University of Cambridge on a collaborative research project. 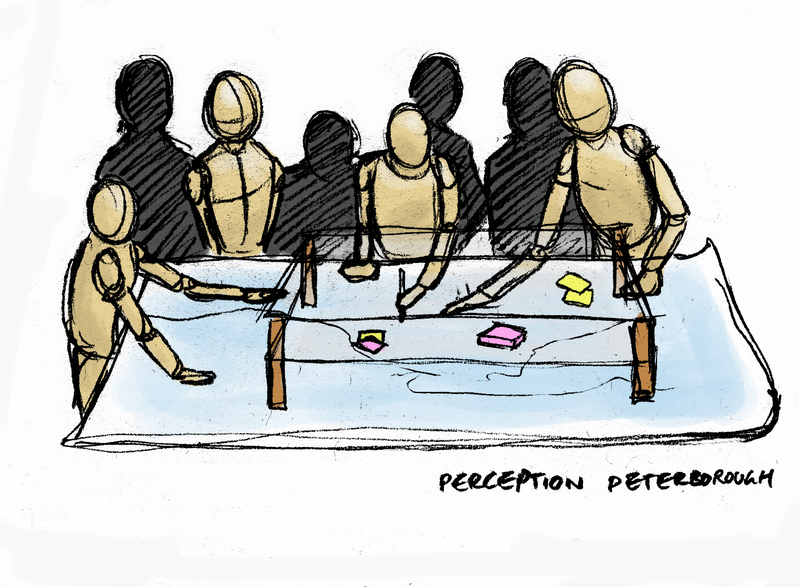 As the artist for this project, my responsibility ranged from creating visual notations during discussion and brainstorming sessions to illustrating the outcomes of the teams’ reflections in the form of insights and observations. My work was incorporated into a set of books known as Agencies of Engagement. 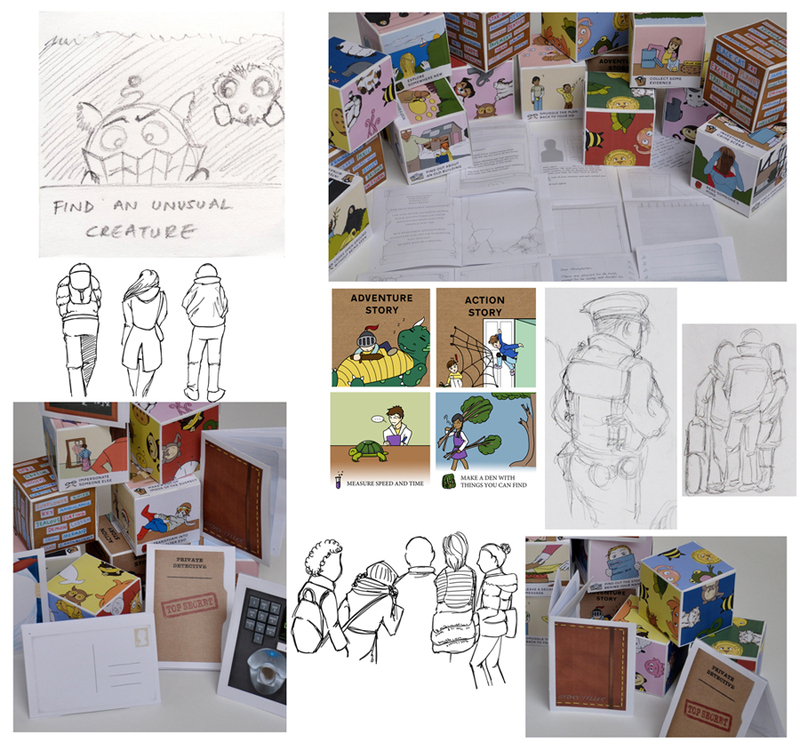 Each book required a different approach to create a series of illustrations, to accompany the written narrative. The very first being, visual notation. 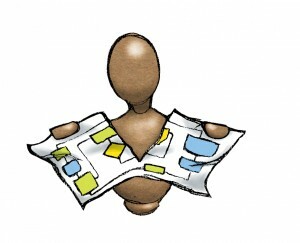 I used this in the early stages of the project to capture the different ideas discussed during brainstorming sessions. The challenge here was that the discussion was live, it was vital to listen carefully; picking out words to sketch as fast as possible and trying not to fall behind. 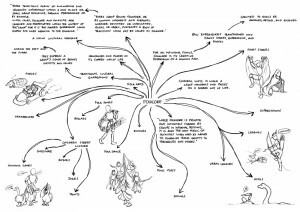 The idea to this approach was to allow others to see the dialogue visually, the illustrations represented words, topics and how it connected with each other. 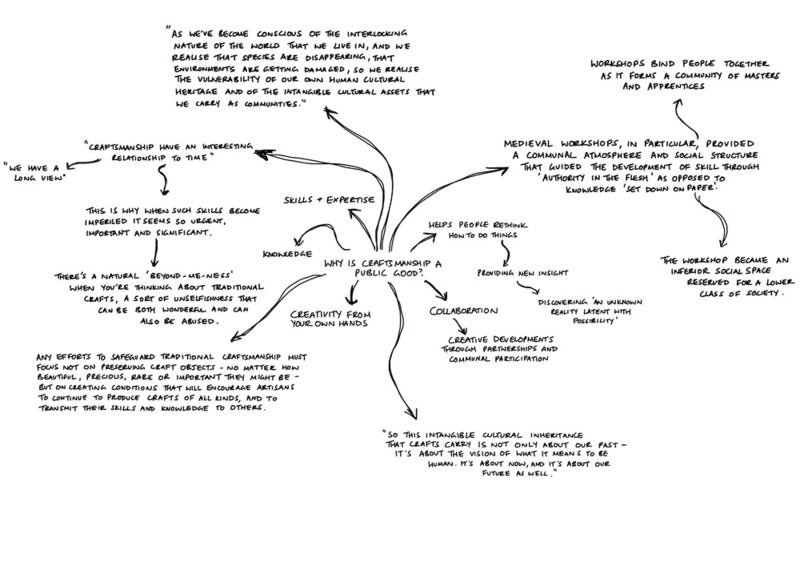 Visual notation during a brain storming session. The next series of illustrations was aimed to capture the moment of an activity, it was placed in the book describing the project’s progress (Project Account). The sketches consisted of members taking part in a workshop, it was illustrated by using the photographs taken during the session as the foundation and creating a detailed line drawing on top to accompany the detailed nature of the Project Account book. Members taking part in a workshop. The most challenging of them all was for the book, Drawing Insight, this book consisted of the teams’ insights and observations. The illustrations were quite conceptual, and although accompanied with captions the representations of these illustrations needed to be obvious to the reader. 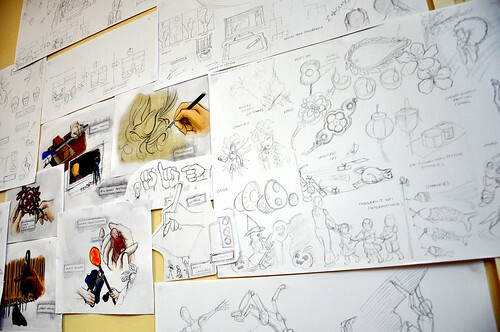 Thus being a very iterative process and required a lot of patience, I would often talk to the team to define the meaning behind captions to develop sketches to reflect it and then after a thorough review sketches would be tweaked, polished and re-polished until we felt that they had captured the right feeling. 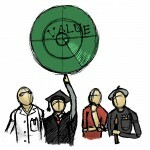 Conceptual illustration from Drawing Insight. 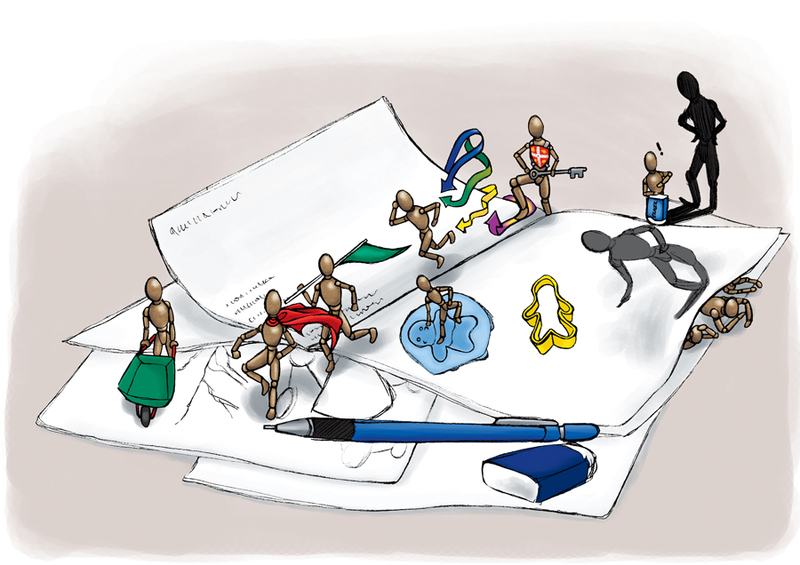 The illustrations used in the Method Stack book, took on the same principle as the Project Account but with less detail. 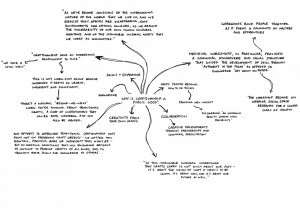 The aim to this approach was to simply suggest and spark ideas in relation to the thorough explanation to each engagement method, by keeping it as simple line drawings it becomes easier for the reader to fill in the blanks with their own creativity. 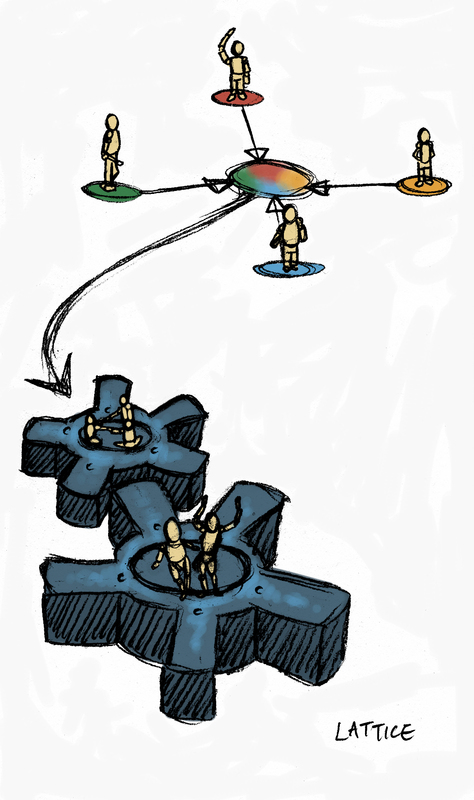 A quick illustration of participants mapping stories. 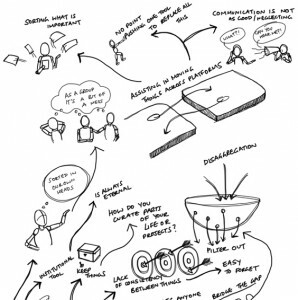 Finally, Catalysing Agency had a combination of both visual notations from an audio recording from the Catalyst Reflection Meeting and conceptual illustrations like those used in Drawing Insight. 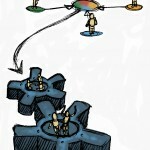 The catalyst role is a person, not a process. This was my first research project with Proboscis, it was a very intricate one and no doubt the experience I gained from this will be invaluable. Learning about the different methods of engaging with participants of this project and putting them into practice, and deciphering complex findings into a visual to give an insight to others were the main lessons learnt throughout this project, it emphasised the importance of dialogue and communication. Agencies of Engagement has enabled me to explore and refine my skills in terms of the different approaches to creative thinking. It wasn’t as simple as sketch what you see; there were multiple layers of things to consider – meanings, perception and how the illustrations were to be perceived. Not only was I able to hone my artistic skills in my comfort zone of conceptual illustrations, I was able to explore new techniques such as visual notations in a live situation and both styles of line art for Project Account and Method Stack. I’ve received my own copy of the finished publication and am overwhelmed with pride, the team did an amazing job and I look forward to participating in more projects like this. The mischievous characters from Drawing Insight. Alice and Giles have been throwing words at me, keeping me busy! Hello! It’s been a while since my last post and what have I been up to you ask? Well, I’ve been honing my skills in advanced Pictionary! Or at least that’s one way of looking at it as it takes on the same principle of visual interpretations from words. For the past few weeks Giles and Alice have been throwing words, concepts and phrases at me to create sketches visualising the meanings behind them. Perception Peterborough – valuing citizens’ voices in city planning & regeneration. 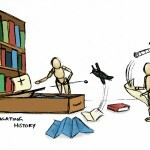 Navigating History – creating new awareness of rich local archives and resources. 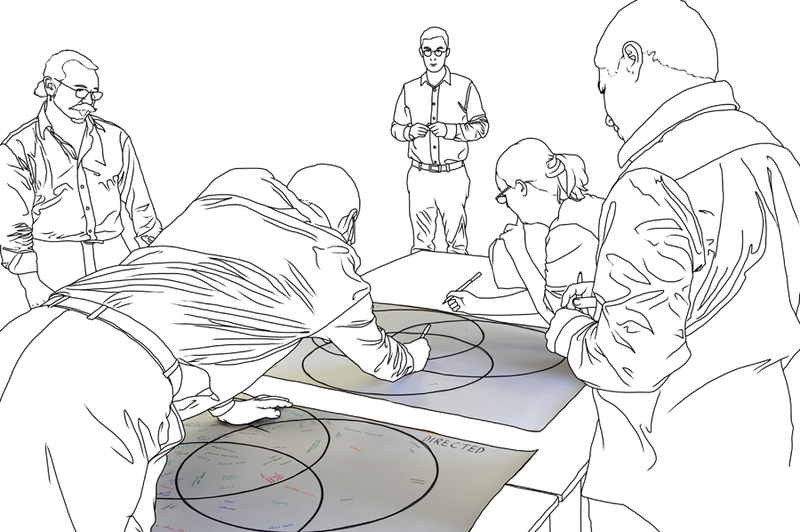 Sensory Threads – revealing value creation in cross sector collaborations. 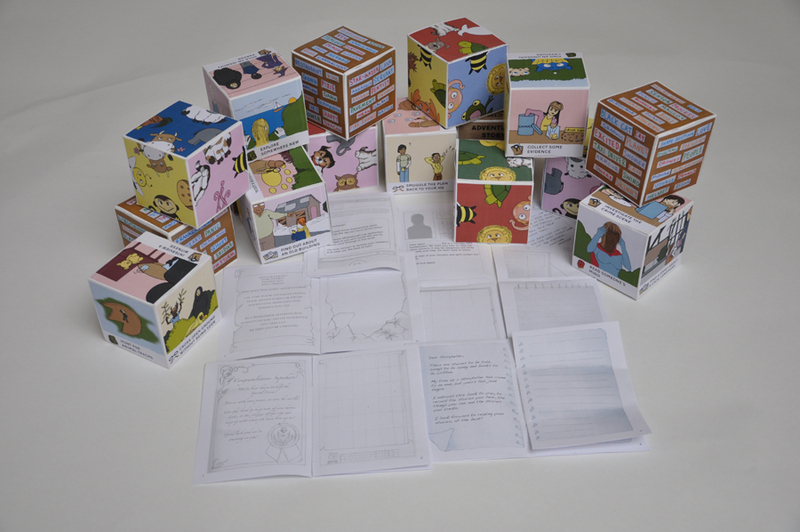 Snout – using play to inspire people and make complex issues more accessible. 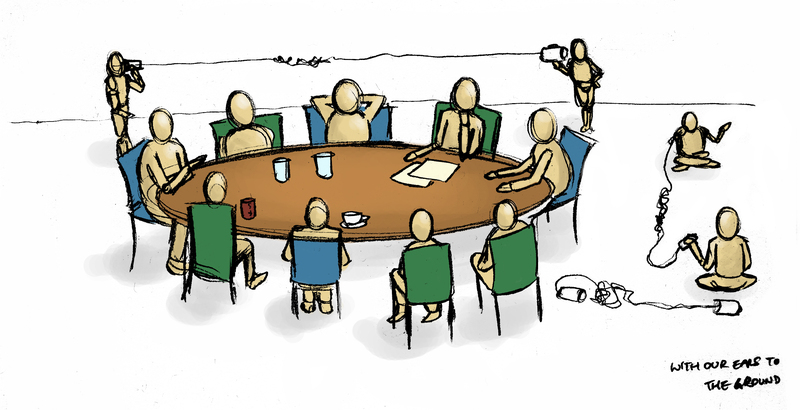 With Our Ears to the Ground – connecting council depts to work together for the first time for cohesive community development. Lattice – providing the catalyst for new creative collaborations. Having been a part of Proboscis for a fair amount of time now, trying to describe the type of work Proboscis does can be a little tricky. So the best way around it was to look at what Proboscis had accomplished in the past, giving me a new perspective on the kinds of projects and themes Proboscis had undertaken and the different types of people they have worked with. This part of the project had given me an great opportunity to exercise my conceptual skills, visualising complex activities and abstract ideas and presenting them in the form of a single sketch. 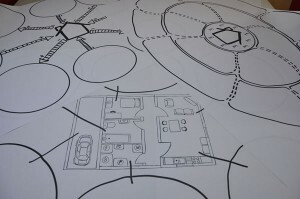 It was challenging creating a sketch that would capture and reflect the sense of a complex project and required a lot of conversation – to which I would carefully listen to pull out keywords that may best describe the process, outcomes and achievements of a project, then further researching to finalise sketches. Throughout the process I’ve developed the ability to visualise concepts using a single word or string of words and sketching to reflect the meaning behind the words or the ideas conveyed, giving me new confidence as a concept artist to visualise something quickly and to use my imagination to give some of the sketches a touch of humour and a new perspective. It has been an enjoyable experience, and given me a new insight to the type of work a visual interpreter/ graphic artist does and I look forward to more work like this in the near future. Hi all! We had our first play test for Outside The Box yesterday with the children who were taking part in the play scheme with the YMCA of Central London. We went with them to Lambourne End Centre for Outdoor Learning, where the children will get to take part in various activities including a chance to have a go with the play sets. Upon arrival I was engulfed by the surrounding greenery, the centre was huge! 54 acres of land; open fields with animals grazing on the grass and various adventure activities built and scattered across the vast fields. As we walked through the reception area to catch up with the children who were currently having lunch. My attention was immediately swept away from a beautiful blond haired horse which trotted passed; a small carriage trailing behind it with children gleefully cheering as they enjoyed the ride, “I want to go on that” was all I could think of after that. After lunch the children were split into two groups and thus it was time to set the cubes free onto the grass and just see what happens. The curious children watched and questioned as Giles placed the play set on the grass, they began picking them up and marvelled at the different drawings and asked who drew them – I felt proud and happy that they really liked them. 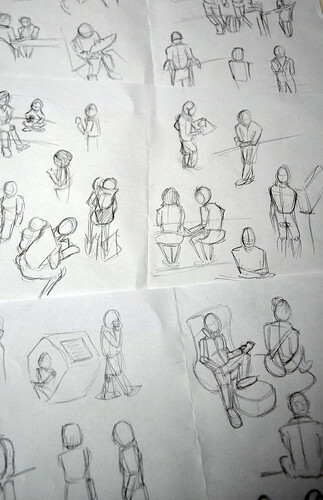 They’ve ask me how did I draw the images to which I explained very briefly the process. Then the blank cubes had become like gold, they all became immersed in the idea of making their own cubes and swarmed around trying to overcome the challenge of assembling a cube and immediately attacking the art box soon after. Frantically scooping PVA glue over the grass and dribbling it across each other, they busied away crafting their masterpiece. 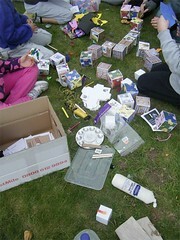 Children crafting their masterpiece cube. There was one girl however, who was more determined to solve the animal set. At first when she couldn’t work it out she claimed the cubes were wrong, so I nudged and gave a clue to which she immediately thought “Ah! so it can also go this way!” she shuffled the cubes and tried again. Eventually she solved the puzzle and huffed “that was hard”. Then the groups switched over, a trio sprinted across the field and sat down to make a cube. They then began playing with the storytelling set. At first they only picked one word from each face of the cube – which made their stories one sentence long, but after suggesting that they can use all the words from each face, their stories became longer. One of the girls used the words in order shown, another used the genre cube – but instead of rolling it she preferred to choose the face that she liked and did the same with the word cubes. They competed with each other to tell the best story and started shouting to drown out each other’s story! Finally the groups reunited to go see the farm animals, indicating the end of the first play testing session. Overall it was a great opportunity to be able to play test with children in a outdoor setting, it gave me an idea of what needs changing and how to set up the next play test. It would have been better to be able to get more children to play with them and to also get some of the boys to give it a go for a fair play test, instead of taking one look at it and tossing it aside for football. I thank the Central YMCA for this opportunity and look forward to more visits in hope that children will like Outside The Box. As for the golden horse that kept trotting passed me numerous times and swaying it’s golden mane as if taunting me…one day..one day..*shakes fists*. 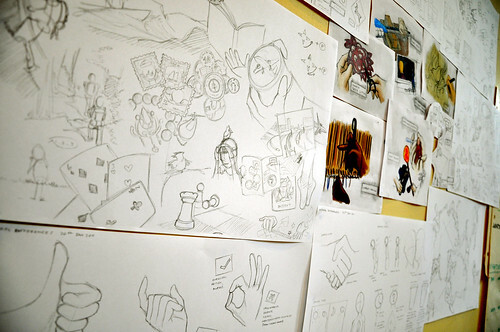 Take notes, draw maps, make sketches, stick things in, scribble away! (Drum rolls) Ladies and Gentlemen, I proudly present the finished eBooks! 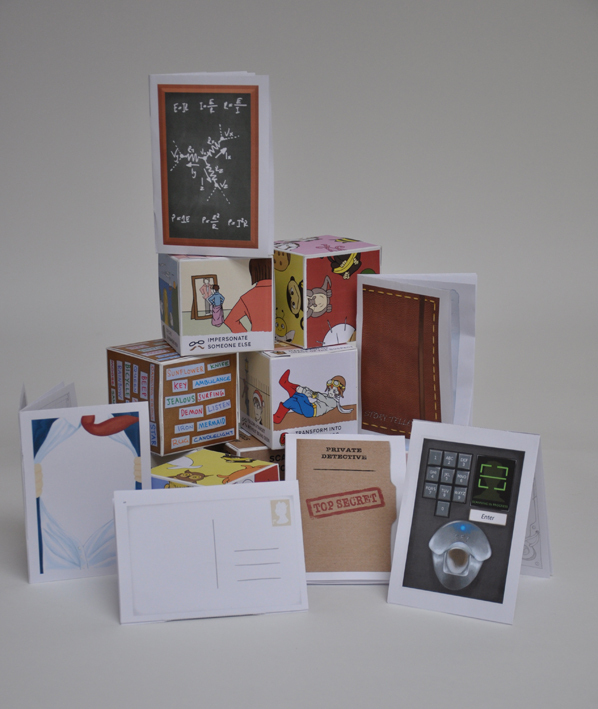 The eBooks are part of Outside The Box and were created to accompany the play sets, they act as props to help stimulate game play. I’ve created a total of six eBooks that fit with the role playing set, each eBook corresponds to the six roles available. Once roles have been assigned, players can take their eBooks with them to carry out missions. They can use it to take notes, draw maps, sketch images or even stick things into, they can do whatever they like with these eBooks that will assist their game experience. But what’s inside you ask? (sniggers). Each book is themed to each role, not just on the cover, but the inside pages too. All pages inside are hand drawn with blank spaces for the player to use, it’s printer friendly and encourages players to freely scribble in them. The eBooks can also be used for the other play sets too! For example, players can choose an eBook of their choice and use it to play along the story telling game. Or they could use the eBooks to create strange combination animals. 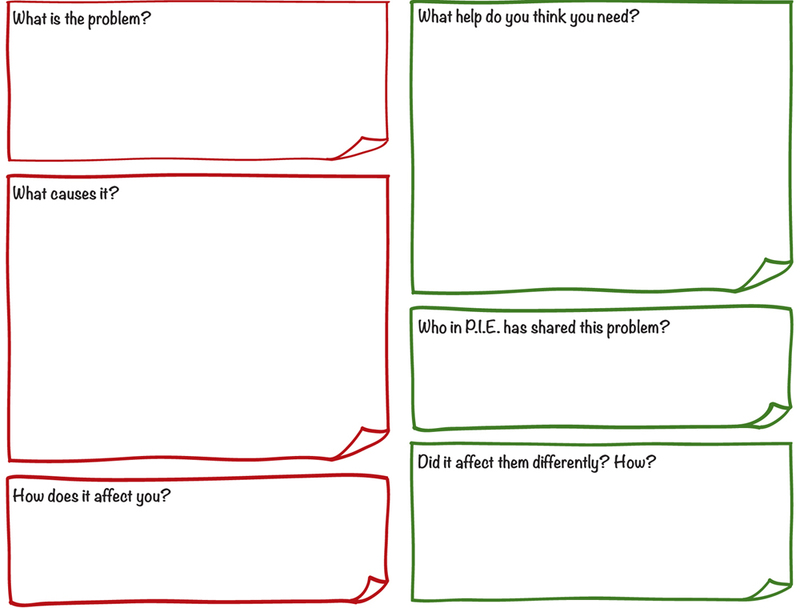 (More suggestions available in the Outside The Box Suggestion eBook). 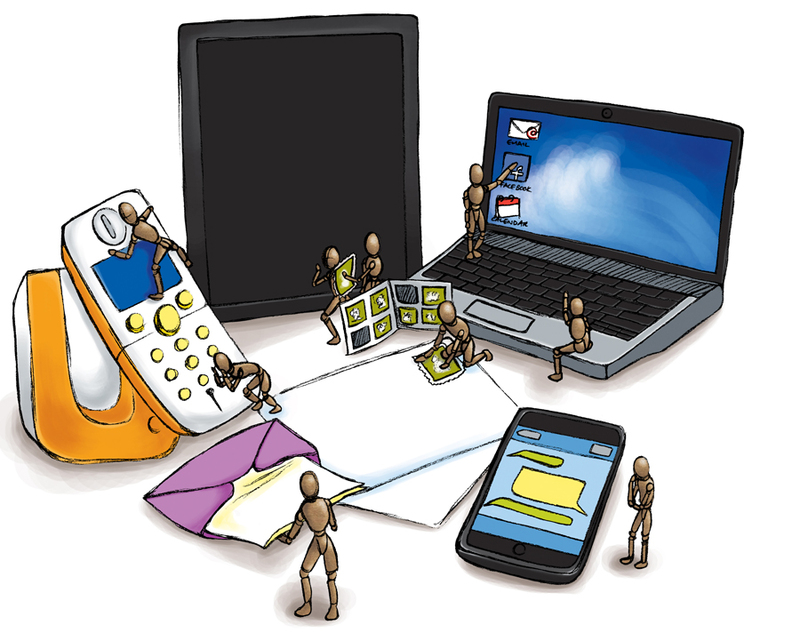 I enjoyed designing and creating the eBooks, it all began with making miniature versions as the initial design. 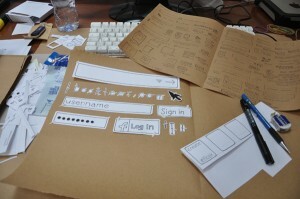 Then making the basic prototype and moving onto finalising details and adding messages to the players. I had a lot of fun making the eBooks, I now hope that players will enjoy the finished product. The eBooks aren't limited to the Role playing set, they can be used for the other games too! It’s time to reflect on the past 6 months as the Future Jobs Fund placement has now come to an end, it really went by quickly! Other than the placement being too short, I can only think of the benefits I have gained with Proboscis during my time here. It has been a great experience to explore more about the creative arts, with plenty of opportunities to utilise my artistic skills in all of the different stages of a creative process and exercising my knowledge with people of different backgrounds and experiences of their own. I am also really grateful to Giles and Alice for their patience and teaching me many things ranging from local area knowledge to introducing artistic influences and techniques in hope that it would inspire me throughout the creative process of each project. With their kindness and constant guidance, they’ve become more of a mentor to me than simply my employers. I also thank the New Deal of the Mind, firstly for organising this opportunity and providing scheduled sessions – The Goals Training programme, offering support and providing information about job hunting. 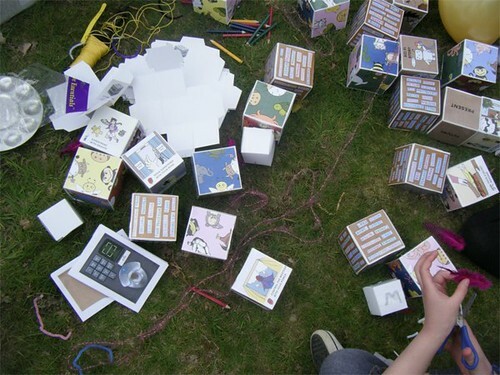 During the past 6 months I have been involved in various projects which include the storyboard eBook for Tangled Threads, then moving onto a project inspired by the Love Outdoor Play campaign with a full play set now known as Outside The Box. 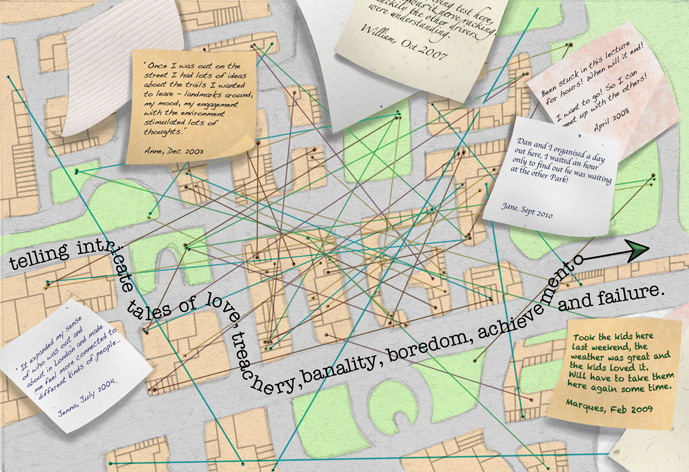 Once in a while I have assisted in the City As Material project and my more recent work is creating visual interpretations for Public Goods and designing eBooks to accompany the play sets for Outside The Box. Some examples of the work I’ve created for the projects I’ve been involved in. Outside The Box was a huge learning curve for me, I learnt many valuable lessons during the creative process. Firstly, how to manage my work flow better. The project became so much larger than anticipated that I found myself struggling with managing the workload, as I had tried to do too many things at once. Then there were elements on the actual product that I had learnt more about, such as decision making for a colour palette and how simplicity can convey ideas just as well as detailed illustrations. I believe there will be much more to learn from Outside The Box, as it will be going through the testing stage soon. I am excited and nervous to see what happens and I just hope that children will like and enjoy playing with them. The biggest achievement whilst working on these projects was adapting. I was able to transfer many of my skills to fit each creative process but it was learning to think from a different perspective and presenting them in a innovative way which was the main challenge. The work flow and thought process also differed from my original training as a concept artist for games, as much of the work would follow a design brief closely, but with Proboscis it was very open and it possessed very little constraints making the possibilities endless. I believe with all these achievements and lessons learnt, it will influence my work in future projects – the way I may approach ideas, deciding the colour palette, considering other ways to communicate my ideas across to reach a wider audience and to create art work that many can enjoy and appreciate. This isn’t farewell! As I am very grateful for the opportunity to stay as part of the Proboscis team so I look forward to future projects and learning more about the creative arts, I’ll be posting about my work so make sure to visit! The wall of visual interpretations have expanded! 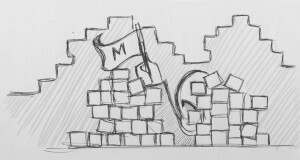 Soon I will invade another side of the wall with my sketches. 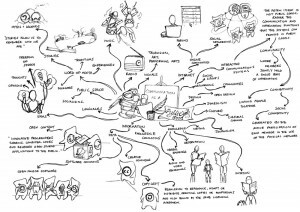 In my previous post, I mentioned a major part of my work is creating visual interpretations as research for Public Goods, Proboscis’ new programme of projects exploring the intangible things we value most about the people, places and communities we live in. So far I’ve been creating sketches using images found online combined with my own knowledge. We decided that it would help to gather inspiration from the ‘real’ world in both drawings and photographs, to be surrounded by people and absorb the atmosphere of everyday life. Usually shying away behind the PC, I agreed to take on the challenge and chose the Science Museum as my first destination. Upon entry there were many objects on display, from steam engines to planes to the evolution of technology. All these objects were traces of what used to be; evidence that reflected on the lifestyle of those that once lived. 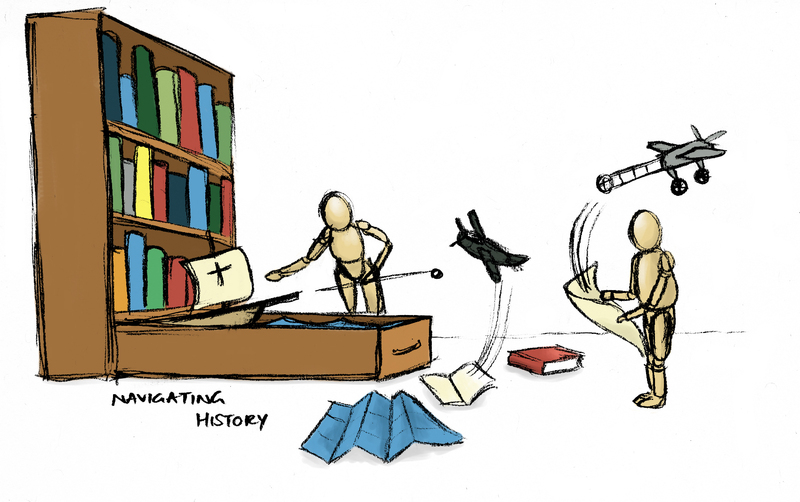 The objects were categorised in a time-line, indicating the different notable era’s in society such as mass production and the industrial revolution, it demonstrated the changes and evolution stages of specific objects and introduced new theories and materials that were readily available of that time and also the trends that influenced them. As I made my way through the different displays, I was overwhelmed by the thought that all these inventions were the stepping stone to today’s technology. If it wasn’t for these people, our world of convenience wouldn’t have advanced so much. The next exhibition was the exploration of outer space, whilst looking at the different satellite and shuttle parts on display it hit me that curiosity is a big part of our human nature. Creating theories and exploring methods to prove them and making new discoveries. But it is science that makes it all happen, by making the intangible into tangible with the use of devices and tools; such as light or the ability to fly. Going upstairs, leaving the historical part of science behind me, I came to the “Who am I?” exhibition. It delved into our biological make up with displays about how our brain is wired and exploration of dreams. The next few displays were about aspects that make us unique individuals such as our exposure to cultures and the environment we grew up in and how such aspects affect us psychologically. I really enjoyed my visit here, and appreciated objects which were the greatest inventions of their time. Although behind glass and never to be used again, just imagining the stories that accompanied it makes each object that more valuable. During my time at the Science Museum I focused on photographing of objects so for the next outing, I headed to Westfield Shopping Center to create first hand observations of people in a public space. From being used to sketching still life or just from imagination it was challenging to draw people that wouldn’t stay still! The aim for such an exercise is to capture the moment, through speed sketching; with enough detail to illustrate the subject’s form. As an artist who loves details, I struggled at first to sketch simplified drawings of people but because there was a chance that the person would suddenly move, I was forced to note down their action quickly. I managed to spend some time just watching how people behaved, the gestures they made when with others and the body language they displayed. But one thing I noticed whilst in the center was; there was no concept of time – with no visible clock anywhere it made the experience feel so timeless and surreal with very little natural lighting. People would often check their mobiles or they too would stop and observe others from the upper levels of the center, whilst waiting for their companion. I’ll be doing more observational sketches later on but at places where people might not move around as often as they would in a shopping center!! Whilst taking a break from Outside The Box I’ve been asked to create visual interpretations for a new project! I’ll be keeping a photo diary of my progress and will post up a photo each week for you all to see. Alice suggested sticking up some of the visuals for the team to see and there will be plenty more to come! It took a bit longer than planned, but the set of cubes for Outside The Box have reached the first prototype stage! (Applauds) It took a lot of energy to meet the deadline but seeing the finished prototype makes all the hard work worthwhile, I am very pleased with the results and hope you all will grow fond of them too! Thank you Giles and Alice for your patience and advice in teaching me the palette decision making process and guiding me in polishing the sets to a finished prototype. Thanks to Radhika and Haz for taking time out to assist in assembling the cubes together and working on the story telling set! What happens next? (grin) we play with them! The next stage will be to test them out, not just with the team but with our target audience – kids! We’ll be thinking of additional ways to play with them, making observations to check that children understand the content on the cubes and hope they will enjoy playing with them. Our findings in this stage will be taken into consideration when making decisions on the final product. Outside The Box is a project inspired by the Love Outdoor Play campaign, which supports the idea of encouraging children to play outdoors. We brainstormed about possible games children could play and creating props to assist their gameplay using Diffusion eBooks and StoryCubes made with bookleteer. The first idea was a visual game using the StoryCubes, which Karen had blogged a sneak peek of a few weeks back. It was a brain teaser type of game, where one image was spread across two squares – so one face of the cube had 4 halves of an image along each edge of the square. The aim was to match up the top and bottom half together. The puzzle only worked if there was nine squares, any less and it wouldn’t have been challenging enough. The original set had 4 themes, the first being domestic pets, the second insects and bugs, the third sea creatures and the fourth snakes. After leaving this set out for members of Proboscis to try and solve, they thought it was humorous mismatching the animal halves together. They came up with many wild combinations such as a mer-dog (top half of a dog and lower half of a fish) which struck the idea of another way to play with this set of cubes – make the sound of the animal on the top half and move like the animal on the bottom half. Keeping this idea in mind, I redeveloped the set by adding different animals which make funny noises or move differently and as a result it made the puzzle easier for a younger age group because it resembled the card game Pairs. More animals have been added! The next set consists of a role playing game, encouraging children to use their imagination and interacting with each other if played in groups. With elements of exploration, this set was most fitting for the Love Outdoor Play campaign. There are six characters to choose from, each occupying one face on each cube with a mission. Just like the first set, this game used a total of nine cubes – meaning each character had a total of nine missions to accomplish. Characters for this set included spy, detective, super hero, storyteller, adventurer and scientist. 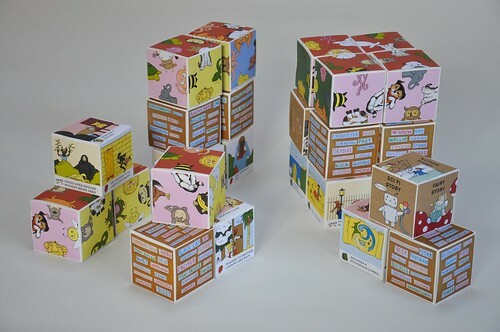 The last set is a story telling game, the set of cubes acts as a starting point in telling a story leaving children to fill in the gaps with their imagination. One cube decides the genre of the story, another cube decides the time setting and a third cube decides how the story will be told. Keeping the consistency of using nine cubes in one set, the remaining six cubes consists of words to which the player will use in their story. At the moment these games are in prototype stage, where the final colour palette is to be decided and the finishing touches to be made and polished. Although I had hoped to have finished the prototypes sooner I guess working on 162 faces was a lot more challenging than I thought (laughs). 120 of the faces were illustrated and the remaining 42 contained words, which the Proboscis team kindly assisted with (thanks everyone!) Nonetheless, I have enjoyed the whole process and think that this project has given the opportunity for team work and I still feel that I have much to learn and look forward to learning more about the different methods used in deciding a colour palette for the final product. It’s been pretty busy during these five months, Giles and Alice have been cracking the whip to keep me busy working (T_T). Just kidding haha. They’ve been great fun, and most generous when offering advice and enlightening me with their knowledge, it always leaves me in awe with the amount of things they know. Also, there has been more placements on board! Christina and Radhika are such lovely people, they both have a great sense of humour, easy to talk to and are always offering to help when it seems like I have too much going on (laughs). Oh and Moin; our programmer, joined just recently too! As for Haz… he’s been picking on me since day one!! that aside, he offers me assistance and I’ve enjoyed his blog posts and look forward to his future posts. Thanks guys for your help and support! During the past few months I have been working on various projects. The first being Tangled Threads, then my current project Outside The Box and offering assistance here and there with City As Material. Throughout these projects I sincerely thank Giles and Alice for trusting me with creating work without any pressure and just allowing me to carry out the projects to the best of my ability whilst offering kind encouragements. I tend to get carried away with trying to perfect everything so I thank you both for your patience and apologise for the delays! If you remember reading my first impressions, I mentioned the many different assets in the studio either tucked away or on display and wondering about the story behind them… well… I’ve joined in with my own clutter! I’ve made so many Story Cubes I can build a fortress! Soon I’ll have enough to make a draw bridge to go with it (laughs). It’s been really fun so far and I’ve learnt a great deal from Giles and Alice. I’ll do my best to fulfil my role and create work which others will enjoy! Have a great Christmas everyone! 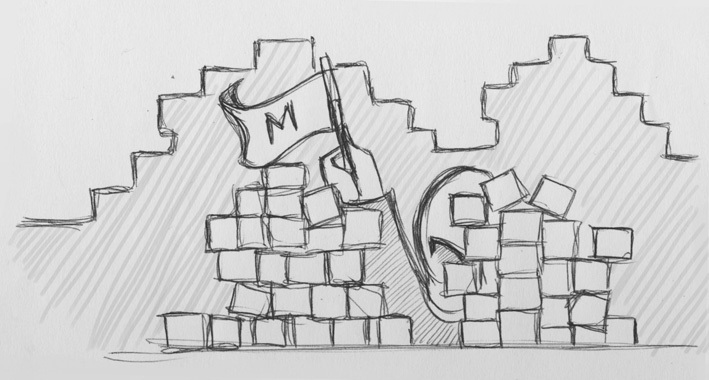 A quick doodle of my fortress! My task was to create a storyboard using only the text Karen had scripted. With her words I had to create a series of fast sketches within a short time frame, jotting down the first visual that came to mind. It was later decided that the finished storyboard was to be presented in the form of an eBook, as a counterpart for a new Proboscis film that will be presented as part of a Leonardo/MIT mobile digital exhibition curated by Jeremy Hight. 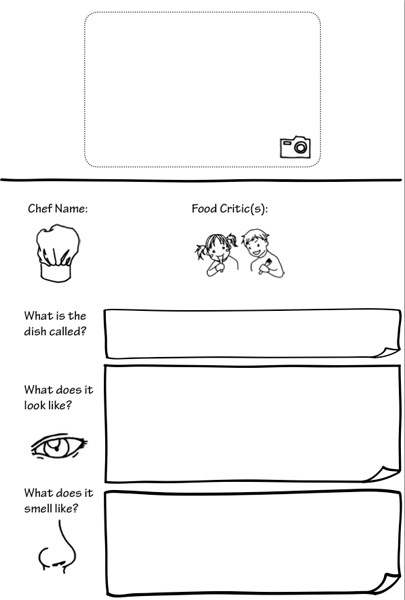 This was my first time creating a full scale storyboard, but it was also my first time adjusting it to an eBook format. It encouraged me to use different panels and discard frames which can be reduced to one panel. I am also glad it became an eBook because it would have been a real shame if others could not see the impressive text Karen had written. The most challenging part of this project was the initial sketches: being asked to do fast speed sketching within a time limit. This method made me stay focused and avoid swaying off into different artistic directions and just sketching the first thing that came to mind, then only further developing that idea. Although this method sounds like rushing, the results were pretty interesting! Overall, it was a great challenging project which allowed me to experiment with a different technique to spark my imagination and creativity. 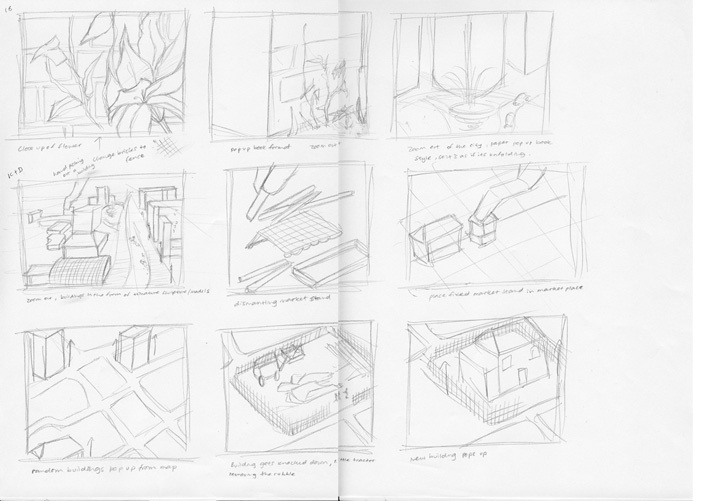 It gave me a chance to use some of my own knowledge about storyboarding and panelling, and Alice had given me a lot of freedom with the concepts. It was also a great opportunity to practice artistic techniques and being aware of areas that may need more improvements. Here are a few samples from the eBook and initial sketches, the first stage as I mentioned earlier was creating the quick rough sketches of what popped up in my mind. 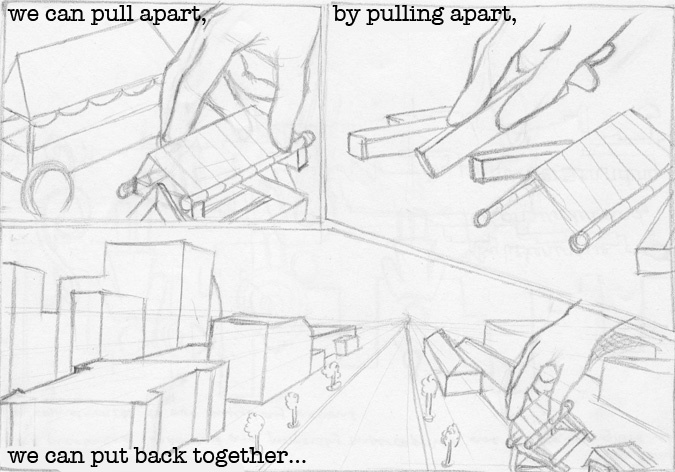 Then I condensed frames to a set of panels on a single page, with this it is scanned in and cleaned up. The final stage was digitally painting the images and resizing them according to the Bookleteer guidelines.